I take a pause in my Microsoft Dynamics GP 2015 Developer's preview series to bring something fun before the Thanksgiving holiday here in the United States. Hopefully you find this trick very cool and enjoy it in your workplace. 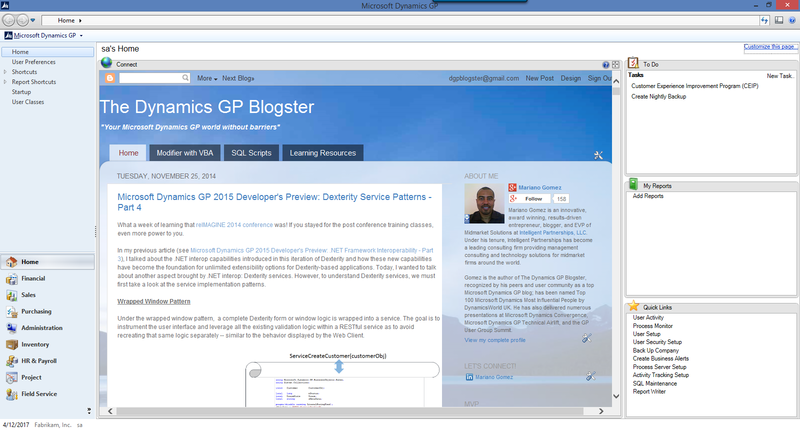 Have you ever wanted to wake up with The Dynamics GP Blogster page as the centerpiece of your Microsoft Dynamics GP application homepage? Or how about your favorite online news outlet? What if you just want to display your company web page or an intranet portal to allow employees to update their information or view the latest company news? Today I will show you how to take advantage of two obscure Dex.ini settings to customize the Connect gadget. If you add these two keys to your Dex.ini file and re-launch Microsoft Dynamics GP the result will jump right at you. I also noticed that if the customized URL contains videos, these will play fine within the Connect gadget. How about that for some educational YouTube videos from the Microsoft Dynamics Channel? I tested it in the Web Client and it also worked just fine. Please send in your comments as I would like to hear how you plan to use these new settings. Also remember, if you are using the Support Debugging Tool, you can roll out the settings to every user without having to visit their workstations. This could be useful for replacing connect with a support portal. Microsoft #reIMAGINE 2014 Conference - Wrap Up!